If you guessed the Canada Sev­ens championship trophy only has the imprints of Fiji Airways Fijian 7s players, than you got it wrong. The Fiji Airways Fijian 7s team celebrates after winning the 2018 Canada 7s in Vancouver. Umesh Chand, a Surrey-rite, considers himself lucky to hold the very trophy that New Zealand, England and Fiji players have raised aloft as tournament winners in the three years’ running of the HSBC World Sevens Series in Vancouver. 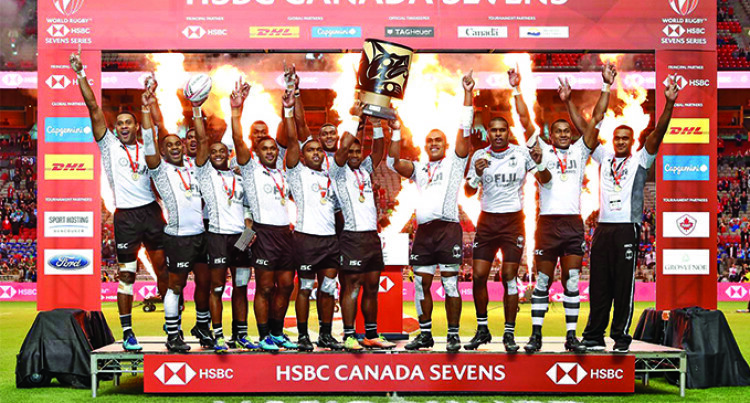 A diehard Fiji 7s fan had a rare opportunity to get the feel of the prized possession during the pre­mium ticket holders reception organised by Canada Sevens last weekend. Umesh Chand, a Surrey-rite, con­siders himself lucky to hold the very trophy that New Zealand, England and Fiji players have raised a loft as tournament win­ners in the three years’ running of the HSBC World Sevens Series in Vancouver. “I feel honored”, he said. The trophy features eagles, a sa­cred symbol of the Tslei-Watuth Nation, it represents the ability to soar and inspire like all great champions do. “It is definitely a unique piece of hardware. I’ve had a picture taken up and close with it. “How often does someone actu­ally get to see it up close, let alone hold the piece that 16 top sevens rugby nations in the world play for”. Chand said Canada Sevens is getting bigger and growing in leaps and bounds by the year and Canadian Fijians have made the biggest backdrop for the two-day event at the B C Place Stadium in Vancouver.